"an iconic video game that not only rescued the industry from its decline, but cemented Nintendo as a trend-setter and juggernaut in the gaming world for decades." On September 13, 1985, a game was released in Japan for the young and hopeful Nintendo Entertainment System at a time when the collapse of the video game industry seemed imminent. What producer and designer Shingeru Miyamoto hoped for his creation was a game that could provide hours of fun and entertain millions of children and adults, most of whom had soured on video games thanks to uninspired and uninteresting releases that were far from enjoyable (thanks, E.T.). The concept was simple: two plumbers dash through a world full of strange monsters in an attempt to save a princess from an evil green dinosaur-looking creature. The results…an iconic video game that not only rescued the industry from its decline, but cemented Nintendo as a trend-setter and juggernaut in the gaming world for decades. Super Mario Bros. is a side-scrolling adventure game consisting of thirty-two levels. Each world is a set of four levels depicting the four areas our heroes must run through: the overworld, underworld, underwater world, and finally, Bowser’s castle. The level design is excellently done, as each level contains enough variation to keep things challenging and fun as you run and jump your way to victory. Simply rushing your way through a level can prove very perilous, as enemies appear on screen to stop you in your tracks. Timing is everything in Super Mario Bros., as you’ll learn after dying numerous times on levels. Patterns exist, but only after repeating a level will they become obvious to you. The simple concept of mastering each level is enough to make the replay value significant, and even thirty years later, running through these levels can be equally enjoyable and frustrating as your memory strives to recall when and where enemies will appear, where to find hidden items and warp zones, etc. The ingenuous of Miyamoto and his team ensured this was a game made to be memorable. I can still recall the day I found that first warp pipe leading to a plethora of coins underground…the eight-year-old in me snickers even as I write this. Wonderful levels aside, other elements are necessary in order to create a marquee video game, and those little things are known as enemies. Here, Super Mario Bros. excels greatly with over a dozen different lively obstacles set in your path, from the marching Goomba and Koopa Troopa to the obnoxious Hammer Bros and Lakitu, who loves dropping Spiny Eggs in your way. If that last sentence sounds like something out of a drug-laden delirium, then you’re in the right place. All the enemies were given their own name and identities, from the literal Piranha Plant to the completely baffling Cheep Cheep, a fish (the last time I checked, fish didn’t make sounds, so I can’t even venture a guess as to how it was named). And then, of course, is the granddaddy of enemies, the Big Bad himself, Bowser (he will later be crowned “King” in later installments), who has invaded the mushroom kingdom with his army of weirdoes and kidnapped Princess Toadstool. Bowser is our heroes ultimate foe, and at the end of every world, you come face-to-face with the monstrous Koopa. Despite his repetitive appearances (you’ll fight Bowser eight times before winning the game), each Bowser is challenging in his own right: some shoot fire, others throw hammers, obstacles complicate and limit your movement on the bridge, etc. Again, timing is everything with Bowser, and knowing what to do and when to do it is the ultimate challenge Super Mario Bros. I think it’s safe to say I’ve gone far enough without even mentioning the names of our heroes. Although they made their debut in the original Mario Bros., Super Mario Bros. made our red-shirted, mustache-wearing plumber, Mario, and to some extent his brother, Luigi, one of the most iconic characters in pop-culture history. Mario broke the video game…literally…appearing in his own animated TV show, a live-action TV show (R.I.P. Captain Lou), and a (sadly, awful) live action movie. And thanks to a litany of video games, cameos, and pop-culture references over the last thirty years, the plucky plumber with an Italian accent is still as well-known today as he ever was. It’s amazing to realize just how famous a bundle of pixels could become. In Super Mario Bros., Mario is the hero (Luigi, as well, if you’re playing with two players), the man given the task to save Princess Toadstool from Bowser to restore order in the Mushroom Kingdom. The great thing about Mario is how relatable a character he is; an immigrant from Brooklyn who earns a living as a plumber. No doubt Nintendo was very conscientious in their decision to make Mario an everyman, because when you take control of Mario, you are, by extension, taking control of yourself. Okay, that’s as Meta as I’ll get in this review…I think. Controlling Mario is relatively simple while surprisingly challenging at the same time. 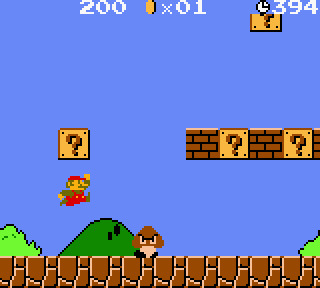 Mario moves left or right across the screen, and with the two buttons available, he can jump or run faster. While it seems easy, the challenge in Mario’s movement is in the timing. Running too fast can lead you straight into the waiting arms of an enemy as they appear on screen. Mistiming a jump can land you at the feet of an enemy, or worse, into a hole (in the ground, sky, underwater abyss, or the dreadful fire pit). So, as eager as it is to race to finish, slow and steady will sometimes prove more fruitful in completing each level. Of course, once playing through the game several times, enjoying the challenge of finish each level faster and more recklessly can be even more fun. Assisting Mario in his quest are a handful of items. A mushroom allows Mario to grow, enabling him to crouch when needed, as well as take a hit without dying (although you’ll shrink). A flower gives Mario the power to shoot fireballs at his enemies, which can be extremely helpful on many levels. Finally, the all-powerful star renders Mario invincible for a short period of time. All three items are hidden throughout the levels, either in question-mark boxes or hidden bricks, and while finding them aren’t necessarily paramount to beating the game, they sure help a lot. Filling out the game play, and what cost me mucho moolah when I was kid (thanks, Nintendo Power), are the carefully and strategically placed warp zones and secret rooms. Earlier I mentioned my glee upon finding that first warp pipe that led to coins; imagine my utter shock and awe when I found out there were two warp zones that allowed you to skip levels and beat the game faster. I’m sure there are some purists out there who refuse to use the war zones because it’s “cheating,” to which I say, “They wouldn’t have put them in the game if they didn’t want us to use them.” Still, I’d love to speak with someone and find out why in the world, when given the choice to warp to worlds 2, 3, or 4, you would warp to anything but level 4. If you’re going to warp, warp all the way is my motto. Finally, this review wouldn’t be complete without addressing one of the most addicting aspects of Super Mario Bros., one that even non-gamers might recognize: the score. Koji Kindo not only composed some great music for an 8-bit video game, but he created some revolutionary pieces that have been used, reused, remastered and reimagined over the last three decades. The music for each level also properly captures the mood of the level, from the uplifting and airy theme over the overworld to the brooding and ominous underworld music (side note: a friend of mine hilariously sang the underworld song to me one day believing it was the theme from Jaws). Even the bubbly underwater theme seems to fit its level like a plunger in a plumber’s hand. Super Mario Bros. is a testament to how impactful and memorable a game can be on all fronts. It’s no wonder this game has been available for purchase or download on almost every Nintendo console since. Nintendo outdid themselves with this game, and we have them to thank for the video game industry not only bouncing back from potential disaster, but for revitalizing an interactive form of entertainment that continues to thrive today. Not bad for a little plumber from Brooklyn, huh?